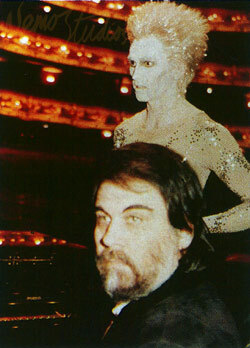 Vangelis at the Covent Garden Theatre for ‘Frankenstein - The Modern Prometheus’. In July of the same year, he wrote the music for his second ballet, Modern Prometheus. The ballet was premiered at London’s Royal Opera House and was performed by The Royal Ballet. The choreography was arranged by the company’s principal, Wayne Eagling. The show’s spectacular costumes were designed by renowned clothes designer David Emanuel. The ballet was a resounding success with the general public. They enjoyed the outstanding music, colourful costumes and dramatic moods conveyed by the dancers. This was a liberating experience for the Greek composer, taking him to new symphonic levels of musical expression. In 1986, Vangelis added the finishing touches to his second collaborative effort with Greek actress Irene Papas. 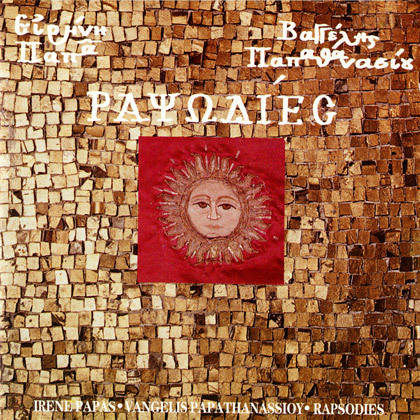 The collection of Greek songs were premiered and performed by the actress in Venice the previous year, and the album collection was released, in Greece, under the title of ‘Rapsodies’. On 25 May 1986, the Sport Aid marathon took place. This was a charitable fundraising event, organised by Bob Geldof, in aid of famine relief in Africa. The event took place simultaneously around the globe. The marathon involved participants from all walks of life, all doing the same the thing at the same moment in time. It was an uplifting event which raised awareness against the suffering in Africa. Video images were televised live from all corners of the globe. The broadcast was set to music specially composed by Vangelis. The Sport Aid theme tune added to the sense of excitement and fervour of the event, encouraging anyone watching to go out and get involved. It was estimated that 20 million people participated in Sport Aid, making it the largest sporting event in history. In the same year, astronomer Dr Carl Sagan’s documentary Cosmos was being re-worked, as it was going to be re-broadcast on television. The first transmission of Cosmos, in 1980, had culled music from Vangelis’ existing catalogue. This time, Vangelis was actively involved, performing his original compositions in a new light, creating a powerful ambience. He was also involved in an amazing new opening theme for Cosmos, which conveyed the documentary’s humane message perfectly. Around this time, Vangelis recorded a brand new arrangement of ‘Hymn’, a composition taken from his 1979 album ‘Opera Sauvage’. It was originally commissioned for E. & J. Gallo Winery’s advert for US television. When the music from the advert was broadcast, it fuelled public interest. Many TV stations and newspapers were inundated with phone calls and letters requesting the identity of the music and its composer. In response to the public’s persistence, Vangelis’ US record company resurrected the seven-year-old album. In the first six months after airing the advertisement, ‘Opera Sauvage’ sold millions of copies, and it was listed among the top-100 selling albums of 1987.